Stifel analysts called the recent dip in Netflix's stock 'overdone' because of Disney's unveiling of its planned offering and reiterated their buy rating and price target on Netflix. Disney's (DIS - Get Report) just-announced new streaming video plan will undercut the pricing for Netflix's (NFLX - Get Report) most popular plan by almost half, and many have cited this aggressive pricing as a sign that the Mouse House's offering will provide stiff competition for Netflix. 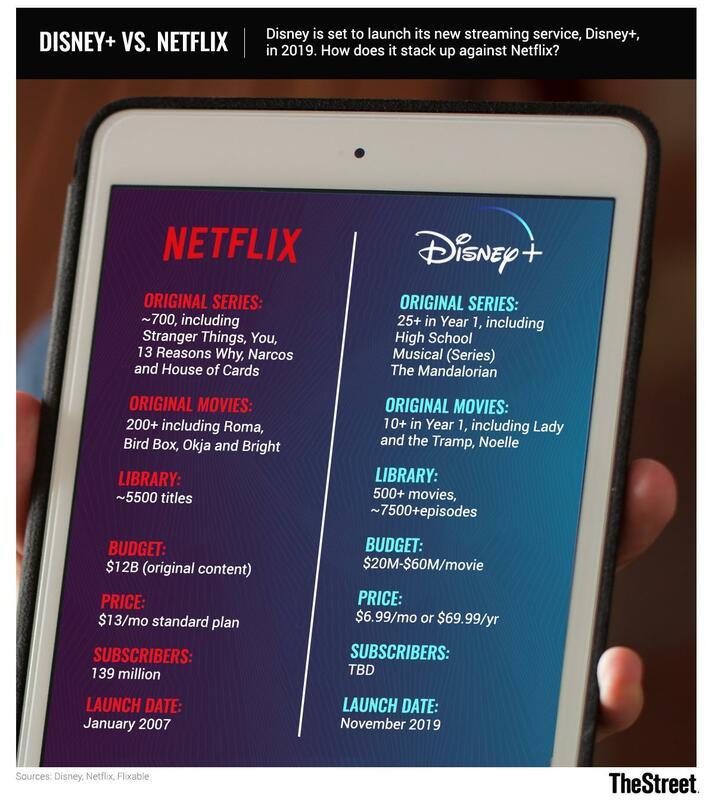 But Stifel analysts think the difference in pricing might actually not be as stark as Disney's $6.99 monthly pricing vs. Netflix's $12.99 cost for its Standard plan might suggest. Stifel analysts Scott W. Devitt and D. Logan Thomas reiterated their buy rating on Netflix and their $400 price target on its stock in a note on Sunday, and suggested that Friday's 4% decline in Netflix's share price following the unveiling of Disney's plans was "overdone." (Netflix shares were down another 1.7% to $345.13 on Monday, ahead of the release of streaming giant's first quarter earnings report on Tuesday). TheStreet will be live blogging Netflix's first-quarter earnings after the close April 16. Please check our home page then for more details. Stifel suggested that it would be better to compare Netflix's content and pricing to a bundle of Disney's services, rather than just Disney+. They cited the fact that the current pricing of Disney's three main streaming services -- Disney+, which is coming in November; ad-supported Hulu, and ESPN+ -- equals $18, while including ad-free Hulu raises this sum to $24. If Disney decided to discount the bundle of all 3 services by 18%, this would lower the price to $15 with ad-supported Hulu, and $20 for ad-free Hulu. That compares favorably to Netflix basic at $9 per month, Netflix standard at $13 and Netflix Premium at $16. "We see little risk to Netflix growth plans and pricing power against this new offering given Netflix's most popular price point should remain lower than the Disney bundle while Netflix is on track to materially outspend Disney on content," the analysts wrote. The two noted the big disparity in the amount of spending on content, especially original content, that the two companies are expected to make. "In 2020, Netflix will be outspending Disney by 6x on content. By 2024, Netflix will still be outspending Disney by 4x on content," they wrote. Disney shares were up 0.4% on Monday to $130.55, close to an all-time high. They rocketed 11% on Friday following the announcement of details about its streaming plans on Thursday evening. Stifel concluded its note by saying "Disney is a great company with a sound product strategy and an iconic brand. That said, we expect Netflix should have a good quarter. Further, we expect Netflix should have a solid year. In closing, we expect Netflix should have a great decade ahead." Disney is a holding in Jim Cramer's Action Alerts PLUS Charitable Trust Portfolio. Want to be alerted before Cramer buys or sells DIS? Learn more now.